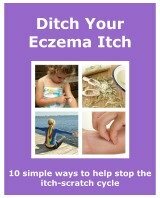 Nummular Eczema is also known as Nummular Dermatitis, Discoid Eczema and Microbial Eczema. The word nummular is Latin. It means 'coin'. It describes the appearance of this type of eczema perfectly. The affected areas are coin-shaped. They can be from a few millimetres to a few centimetres in size. They are called plaques. The plaques are made up of tiny, raised red spots. They have a well-defined edge. They are often in an even pattern. It is sometimes mistaken for allergic contact dermatitis and irritant contact dermatitis. The patches in those types have an uneven edge. Anyone can be affected. Someone with the condition is already likely to have dry skin. A history of or already having atopic eczema is common too. Men in their 50's and 60's are the most prone. Women are more likely to have an outbreak in their teens and twenties. It is rare for children to be affected by it. The symptoms to look out for are the coin-shaped plaques. When they first appear they look red, scaly and oozy. Over time they become drier and redder. It is a very itchy condition. Some thickening of the skin may be visible if it has been scratched over a long period of time. The plaques are very prone to getting a bacterial infection. Because the skin is so itchy, it is scratched. This damages and breaks the skin, allowing bacteria to enter. If an infection is present the plaques ooze fluid and blisters can form. The skin forms crusts. The affected areas also become redder. With this appearance it can sometimes be mistaken for psoriasis. It is unknown what the cause actually is. It doesn't seem to be genetic and it isn't contagious. It is thought it could be to do with winter weather. It can dry out the skin. As can a dry environment, like a centrally heated room. Getting an injury to the skin, like an insect bite or sting, a cut or a burn could also be a probable cause. It is thought that excessive alcohol intake can play a part in some cases. As can stress, though it is not thought to be the main cause. This type of eczema is harder to treat than some others. If there is an infection, antibiotics maybe prescribed. The condition can be stubborn and the above treatments may not work. For more stubborn and severe bouts, uv light treatment may be tried. A diagnosis can be done by a doctor. They will look at the condition of the skin. Looking for the tell-tale plaques is a good start. Also if it is itchy, and when a flare up occurs. It affects any part of the body. Mainly the backs of the hands, forearms, legs and torso. If your doctor has any doubts, they may refer you to a dermatologist. If you have any nummular eczema stories or tips, then fill in the form below. Share your experiences with other visitors.